Learn everything you need to know about your 43 week old baby. Track important developments and milestones such as talking, walking, growth, memory & more. Got a little copycat on your hands? Around this age you might notice that your baby imitates everything you do. She might try to feed you a spoonful of the applesauce she's eating, rub you with her washcloth while you're bathing her, or bang on the computer keyboard if you hold her on your lap while dashing off an e-mail. Babies learn a ton through this monkey-see, monkey-do approach, but it's not just your positive behaviors she'll pick up on. If you yell at your children, chances are they might take to shouting. Get stressed out or frustrated pretty easily? She'll likely copy that too. No one says you have to be a saint, but if you find yourself getting angry or nearing wits' end, give yourself a quick time-out before you blow up in front of Baby. You can always put her in her crib for a few minutes while you take a few deep breaths in the bedroom. You'll feel better, and she won't pick up a habit you really didn't want to hand down. Also, don't let this whole "mini me" phase fool you too much. Your baby is developing a keen sense of her own identity right now. She's beginning to understand that her belongings are distinct from others; she might be able to find her own toys in the playroom, for example, and prefer them to her brother's. She's also learning that her voice, face, and body parts are different from everyone else's. You can reinforce this by picking up her favorite stuffed animal and naming each of its body parts -- then IDing the same parts on your baby. After a several repetitions, try asking your baby where her head, eyes, ears, and toes are. You might be amazed to find her pointing to them soon. Time for a little shoe shopping -- for your baby, that is. Once she starts walking, shoes will help protect her feet if she wants to give it a go in public places or on potentially unsafe surfaces, such as a concrete driveway or splintery deck. Choose shoes with a breathable fabric to keep little feet well-ventilated. Soles should be flexible but firm enough to prevent discomfort if she steps on sticks or rocks. And remember: Fit is key. If they're too big they'll make her trip and fall, so don't plan on buying the next size up for her to grow into, although a little wiggle room in the toe is fine. Your best bet is to head to a children's shoe store and have a pro measure her foot and show you how to gauge a good fit. But while you're indoors, it's best to let your baby practice walking barefoot, since that actually helps her balance better. While you're up close and personal with your baby's feet, you might notice that her arches are practically nonexistent. Flat-footedness is normal during your baby's first year or two both because the bones and joints of the feet are flexible, flattening out when your little one stands, and because any arch that exists is hidden by a pad of fat on the inside of the foot. Your child's arches won't be well-defined until age 6 or so. Your baby's first birthday might be nearly two months away still, but now would be a good time to start thinking about the party plans. You've probably heard that this party is more for the parents than for the baby -- and while that couldn't be truer, it's still a great excuse to channel your inner Martha and celebrate the amazing, incredible year your family's just shared. If you're throwing a big bash or even just a mellow family gathering, you have plenty of time still to nail down a theme, cake, and all the little details, but send out a save-the-date email now so all your Very Important Guests, including grandparents, aunts and uncles, and day-care friends, will be able to attend. If you were planning to invite lots of little pals, however, you might want to reconsider. A party with a dozen 1-year-olds sounds adorable in theory, but it might translate to lots of cranky babies (and very distracted parents) earlier in the game than you'd hoped for. Limit the guest list so it includes no more than five or six babies and toddlers. And make clear that parents are expected to stay with them the entire time. 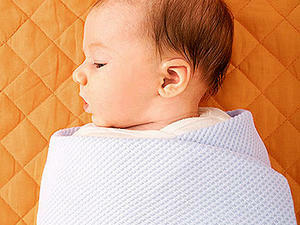 Give your baby kisses, hugs, and snuggles to help build your baby's emotional and social skills. How can I make my baby listen when I say "no"?